I love my history teacher. This year was the second year I've had her (I had her for World History freshman year); she is pretty much the reason that I took Euro. And it was a terrific year in that class! I'm sure you're wondering what this has to do with food. Was I inspired by history to be driven to the kitchen? And haven't I been out of school for a week? After the AP test, my history teacher invites her classes over for dinner. She makes chili and rotini pesto, and six (or maybe it was seven?) different types of cookies. The most popular, among my friends and I at least, were the ginger crackles, so before I left to head home, I asked her for her daughter's recipe. The next week at school, she presented me with a packet of the cookie recipes. I was thrilled! So when finals rolled around and my English teacher told us we could bring in treats along with our game projects, as unseasonal as it seemed, I decided it was time to make Ginger Crackles (along with ever festive M&M cookies, of course.) While they didn't bide too well at school (hey, what can I say? They were in a plastic bag and competing with a cookie cake, popcorn, candy bars) they were a major hit at my parent's office. Spiced without being too spicy. Apparently the Germans really liked them. Makes a few dozen. Don't remember exactly how many. Note: I'm not calling these Shana's Ginger Crackles because I made some modifications, which didn't necessarily improve them, nor did it hurt them, based on what I had in the house. My dad really liked them and wanted me to record those changes. He'd never had them before. I'd run out of butter, so that necessitated that change... as well as the availability of the spice cabinet, allspice in place of cloves; and blackstrap molasses worksfine as well. 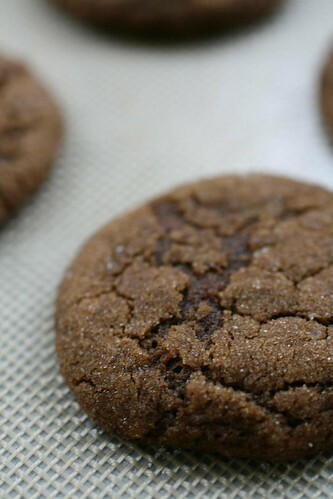 Normally I make cookies with at least half whole-wheat pastry flour, but I used all-purpose this time. I think they would hold up to the WWPF though. Preheat oven to 375F and line two cookie sheets with parchment or silicone liners. In a medium bowl whisk together flour, baking soda, cinnamon, ginger, cloves and salt. In a large bowl beat together sugar, butter, molasses, egg and vanilla until smooth. Add flour mixture and beat on low speed or stir until flour is incorporated. Pour sugar in a small bowl. Shape 1 tablespoon dough into balls (if dough is too sticky, chill for 30 minutes before proceeding, but not too long or sugar won't adhere as well.) Dip each ball in sugar to coat the top. 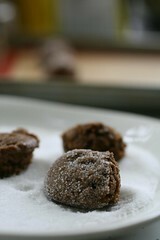 Place balls 1 inch apart of cookie sheets, sugar side up. 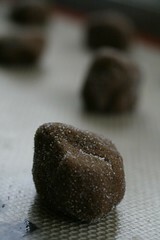 Bake 9-12 minutes, rotating halfway through, or until tops are cracked and dry to the touch and edges lightly browned. Let cool on pans one minute; transfer to wire racks to cool completely.